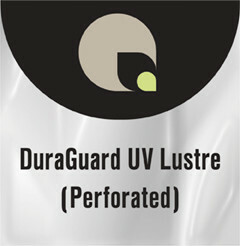 DuraGuard UV Lustre Perforated is pre-perforated for use in heat vacuum presses. It is a PVC (vinyl) laminating film with a semi-gloss finish and excellent UV protection. With a pH neutral adhesive and UV absorbers, this product is perfect for use on nonporous media such as resin-coated photographs. This product is suitable for fabrics, canvas, and even protection of raised surfaces such as leaves and dried flowers.